Intelligent simulator hardware platform for the RBS 70 anti-aircraft missile system. 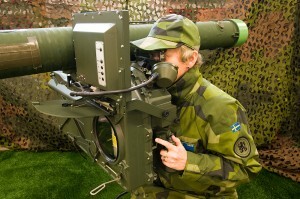 The RBS 70 simulator is an example of a tailor-made system solution designed and produced by MSE. It is developed for the original RBS 70 system and completely adapted to realistic environmental conditions. All ready for download of simulation software. The system is designed and delivered according to customer requirements and specifications for two main user modes: stand-alone mode and for integration in various systems. This solution is explicit developed for indoor use. When exercising scenarios the surroundings are substituted on a ”coarse aim monitor”, which is firmly mounted on the simulator sight house. For fine aiming, the integrated optical sight gives a view visualised by a high resolution micro-display. 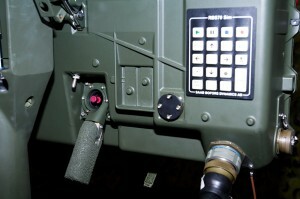 All functional signals of the system, such as signals from joystick, operation panel, handles, switches etc are acquired by the in simulator sight built-in interface electronics and then forwarded by RS232-communication to the simulator computer. 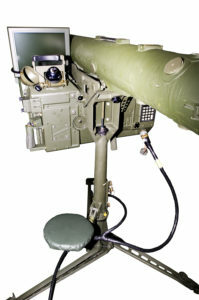 The simulator has an interface unit especially designed for the RBS 70 application. The simulator stand and sight power supply are distributed via the unit. All signals are passing through it. The simulator computer executes all signal processing and is prepared for generating realistic scenarios in 3D environment. The interface-software of MSE, an NT-service, emulates all functionalities of the original RBS 70 as identically as possible. When not simulating the joystick and key panel signals are transformed into mouse/keyboard functions in the windows application activated. The software also generates data for transferring to superior controlling system. The assistant computer is used for monitoring and controlling the scenarios of the simulator. Both computers are built from COTS. A central power unit distributes the power within the system. Therefore just one external connection is required and tangles of cables can be prevented. The simulator stand has been provided with an angular pickoff mounted inside its stem giving data on which way the simulator is directed. All signals between simulator computer rack and simulator stand/sight are transferred through only one cable. This guarantees a rapid and gentle establishing. • Electronic Interface for data acquisition. • Assistant computer (including monitor). • Internal cables and connections.